Education • Experts: More women needed in areas where they are underrepresented. Trent Nelson | The Salt Lake Tribune BYU Biology professor Dr. Jamie Jensen taught a Biology workshop to young girls at the Expanding Your Horizons event at Utah Valley University in Orem on Saturday. Orem • To get students interested in biology, Jamie Jensen subjects them to the peroxide challenge. In this exercise, you put a food item in a test tube and douse it with hydrogen peroxide. 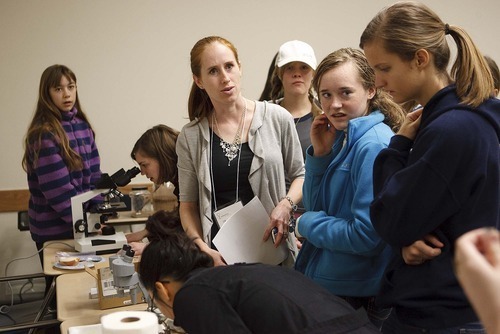 "Awesome, eh," the Utah Valley University assistant professor of biology told a roomful of girls Saturday. The peroxide bubbled into a pink foam as it enveloped a dollop of beef liver. "The one you have to be careful of is the blood because it gives a violent reaction." Jensen was among 45 women scientists and professionals presenting at UVU's Expanding Your Horizons, an annual conference to encourage girls in grades 6 through 12 to pursue careers in science, technology, engineering and math, the so-called STEM areas in which women are underrepresented. At least 850 girls and parents attended, some arriving by bus from Monticello and other far-flung corners of the state. Research has shown girls often abandon the sciences midway through high school, shrinking the pool of college-bound students interested in scientific and technological fields. "There's a stereotype that the smart kid is not the popular one  if you want to have a boyfriend, you can't be smarter than the boy," said event organizer Jennie Briggs, director of UVU's Equity in Education Center. Expanding Your Horizons is a nationwide effort to break down the walls that keep young women out of science. Another conference will take place in Salt Lake City on Saturday. "The workshops are very interactive. The girls will learn what education it takes to be in that career, the potential salary and benefits, the pros and cons, and they will also have the opportunity to participate in a hands-on activity that relates to that career," Briggs said. "A woman will work at least 35 years of her life. A lot will fall into 'pink-collar' careers. You don't know what will happen in your career, so you have to prepare." A key part is going to college and graduating. And being driven by curiosity, according to keynote speaker Ellie Gates, who directs global management development for Adobe Systems. "Be aware of what interests you because those are clues to your future," Gates, who majored in psychology, told the students before they dispersed into classrooms scattered around UVU. "Invest in yourself and you'll have more options later on." Brynn Heckel, a sophomore at Maple Mountain High School in Spanish Fork, loves science and expects to take AP physics next year. She walked out of the genetics workshop in UVU's Pope Science Building on Saturday amazed at the choices awaiting those who study molecular biology. "There are a ton of careers you can get into," she said. "You can help in a ton of different ways, like fighting disease, and even cars with alternative fuels." Julianne Grose, an assistant professor at Brigham Young University, described how genetics researchers uncover the connections between genes and diseases and how bacteria can be manipulated to produce ethanol. "This brings up a whole new field of ethics. How much should we change plants or bacteria and what are the risks?" she said. Grose's research hunts bacteriophages, which are viruses that infect specific micro-organisms and can be harnessed to protect crop plants from disease and for other beneficial uses. Downstairs from Grose, Jensen guided girls through a process of deduction to determine what was going on with the peroxide reactions. A big clue: A potato bubbles, while a potato chip just sits there. "What does a potato have that a potato chip doesn't? Living cells," Jensen explained. Thanks to this ability to react with living cells, peroxide is used as a disinfectant and bleaching agent. Then Jensen moved on to meal worms, which can be a nutritious snack for those seeking culinary adventures. These experiments give a taste of academic careers in biology, which are geared toward answering questions about life, according to Jensen, whose research seeks to understand how the brain learns. Her career, split between the classroom and the lab, is not only fun, it also gives her the flexibility to spend time with her three young sons and still get early-morning jiu-jitsu workouts. "I'm my own boss. I teach the classes I want, the way I want. It's great for being a woman," Jensen said. "It's not like you clock in and clock out, as long as you get the work done." P This nationwide campaign organizes conferences to encourage girls in grades 6 through 12 to pursue careers in science, technology, engineering and math, the so-called STEM areas where women are underrepresented. The next Utah conference is Saturday at Salt Lake City's Northwest Middle School, 1730 W. 1700 North. For details, go to http://www.atk.com/eyh/SLC/eyhSLC.htm.